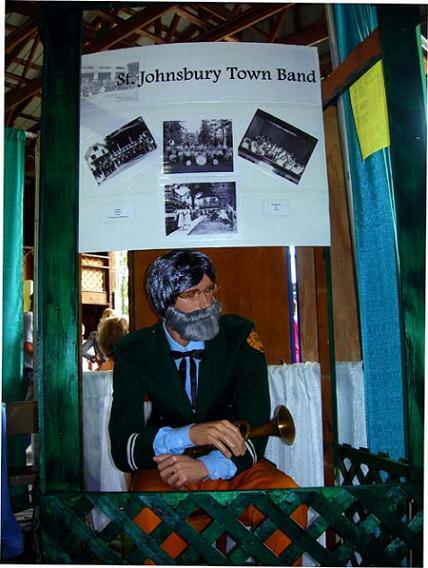 This page contains a brief history of the St. Johnsbury Band. Click on any of the images to see a full size image. 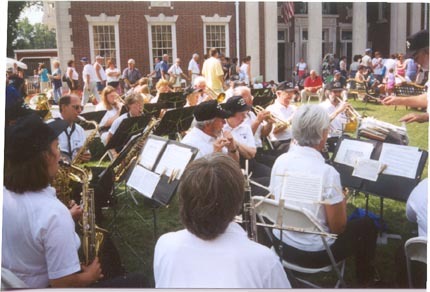 The St. Johnsbury Band celebrated its 175th anniversary in 2005. Founded in 1830, the St. Johnsbury Band is the nation's third oldest band in continuous existence. The West Point Military Band (1827) and the Allentown, PA Band (1829) are older. The St. Johnsbury Band has been known by several names throughout its history. It was originally known as "The Brass Band" and played under that name until 1859 when it became "The Cornet Band". The Band continued to be known as "The Cornet Band" until 1885, when another name change labeled the Band as "The Serenade Band". 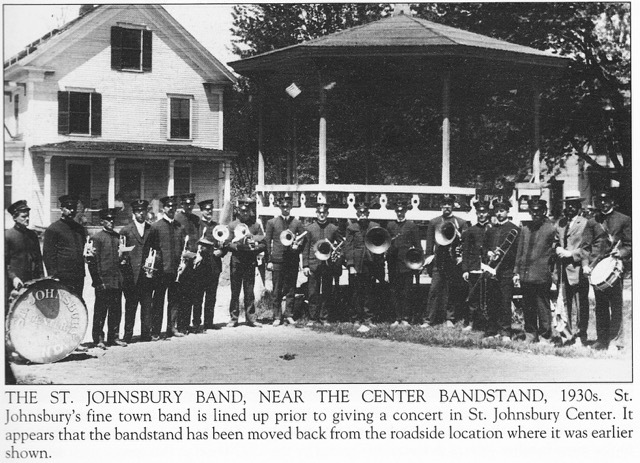 In 1912, a competing band in the town merged with "The Serenade Band" and the combined group became known as the "St. Johnsbury Consolidated Band". That name was later shortened to the current "St. Johnsbury Band". Through the years, the St. Johnsbury Band has played in many places. In the early years, the main site for concerts was in a bandstand in Arnold Park at the north end of Main Street. The Band often played at rallies in Monument Square next to the courthouse during the Civil War. Those performances were held to enlist men in the Union Army. Benjamin Harrison was the first President the Band had the honor of playing for. He was escorted in a parade to the Colonel Fairbanks mansion on Underclyffe Street. The St. Louis Exposition in 1893 was the site for another Band performance. The "St. J March" was written around the turn of the century when the Band had 25 members. In 1912, Theodore Roosevelt was in the audience for a Band concert at the courthouse. That same year, voters in St. Johnsbury started an annual allocation of $1000 to the Band to help cover their expenses. The string of funding was broken in 1979 but was restored in 1980. This annual funding has continued but has been decreased to its current level of $770. The 1920's and 1930's were good years for the Band. The Band organized an international band association and sponsored band festivals. These festivals included groups from Vermont, New Hampshire, and Canada. The crowds attending these concerts often numbered in the thousands. The World War II years saw 23 members of the Band serve in active duty in the armed forces. All 23 of these members survived the war with many earning decorations for meritorious service. While so many men were serving the war effort, women were allowed to join the Band for the first time. Their contribution was significant and continues so to this day. 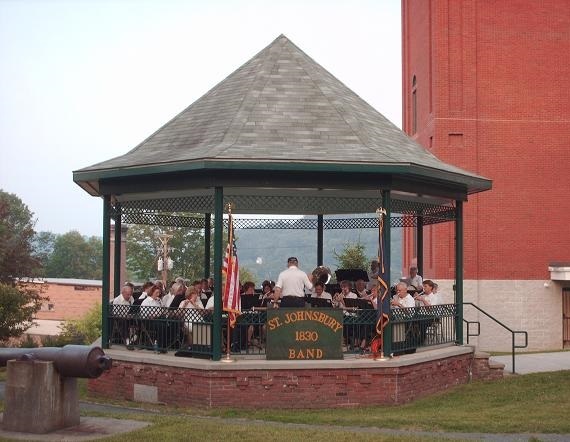 Since the 1950's, the St. Johnsbury Band has continued to play and delight the St. Johnsbury community and communities in surrounding states. The Band's Monday night outdoor concerts during the summer in the bandstand in Courthouse Park have been a longstanding tradition enjoyed by all ages. Memorial Day and Veterans Day parades also see the Band participating. Arthur Fiedler of the Boston Pops became an honorary conductor in 1978. The Band frequently plays at fall foliage celebrations and joins the St. Johnsbury School and St. Johnsbury Academy bands for an annual spring Festival of Bands performance. The Band also has a longstanding tradition of performing in the Woodsville-Wells River 4th of July Parade and presenting a 4th of July evening concert in North Woodstock, NH. The St. Johnsbury Band represented the State of Vermont on Vermont Day at the Eastern States Exposition (the Big "E") in 2002 and 2003. The Band played a midday concert and then performed later in the day at the big parade through the Big "E" fairgrounds. One year was highlighted by riding on the top deck of a red Peter Pan bus with Captain Hook and Peter Pan while the other year was marked for performing in the parade before a record crowd of over 154,000 guests! Challenges are not new to the St. Johnsbury Band either. In 1999, the Band combined forces with a unit of the Vermont National Guard and performed a full version of the 1812 Overture, complete with cannon, for the 4th of July. The Band performed in the 1st Annual Lake George Band festival in Lake George, NY as part of its 175th anniversary in 2005. A Farmer's Night concert in the rotunda of the Statehouse in Montpelier, Vermont was yet another highlight in Band history. 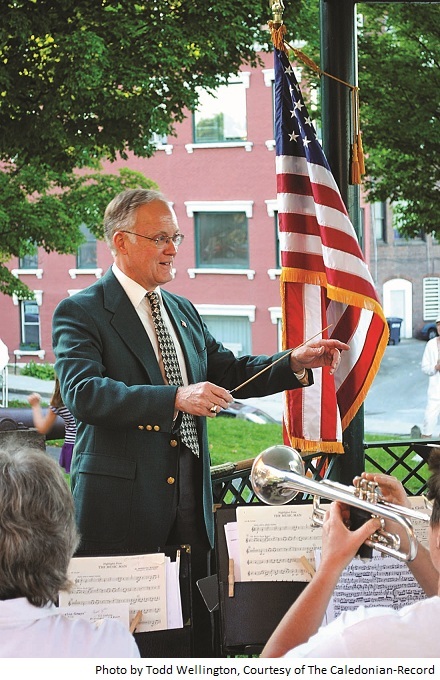 Former Governor Jim Douglas was the guest conductor to open the Band's summer 2012 season. Governor Douglas is a musician and has performed with other groups in Vermont. He was a very able conductor. Peggy Pearl, the director of the St. Johnsbury History & Heritage Center (St. Johnsbury History & Heritage Center), wrote this brief history of the Band. It appeared in The Caledonian-Record (6/27/2012). Click here to read the article. The Band enjoys serving the community of St. Johnsbury with its opening summer concert at the St. Johnsbury Health and Rehabilitation Center and closing each season with its annual Christmas concert which includes a visit from Santa himself! The Band currently performs its summer concerts in the bandstand in Courthouse Park. This is not the original bandstand for the Band. 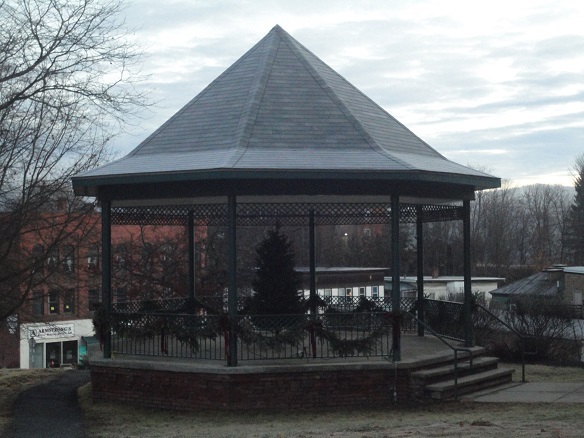 Here is a brief history of the current bandstand, courtesy of John Gebbie (owner of St. Jay Hardware) and Archie Prevost (St. Johnsbury Rotary). 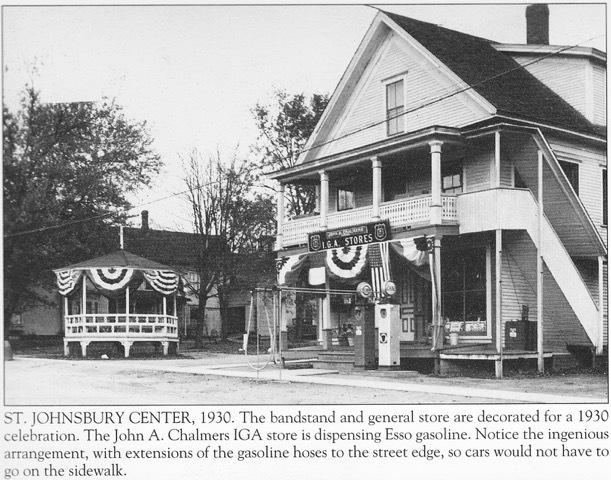 In 1983, the St. Johnsbury Rotary Club decided to do a community club project for the St. Johnsbury Band, the 3rd oldest town band in the country. The community decided two bandstands weren't needed. The old bandstand in the park by the railroad station on Railrod Street was torn down. The bandstand at the courthouse was old and a new one was to be built in its place. On June 6, 1984, new design drafts were drawn up. Ground breaking was planned for May 1, 1985. Jim Dewitt was president for three months in 1985. Archie Prevost was president for twenty-one months ending in 1986. Sean Duffy from Fairbanks Scales had all the steel and welding work done. He would also oversee the project. Archie wire brushed and painted the steel for several nights. John Gebbie, assistant to the project, tore down the old bandstand with the help of Don Bostic&apos;s son, Glenn. He used the old materials at a camp on Joe&apos;s Pond. Durward Ellis donated the Kyanize paint. Karl Armstrong Masonry did the brick work. 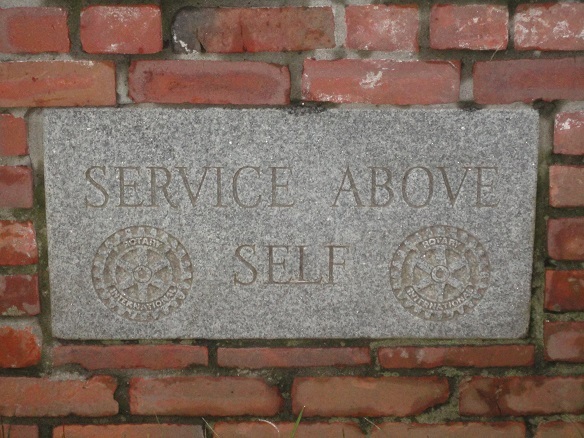 Anair Memorials donated the granite for the Rotary emblem, which can be seen on the north side of the bandstand. Dale Wells handled the building construction. Armando Young installed the pad (floor). William Rodd of Rodd Roofing put on the roof. The location of the bandstand was picked knowing the addition to the courthouse was coming. Murphy Electric wired the bandstand. Landscaping was done by the St. Johnsbury town manager, Dave Clark, overseen by Linda Garey of the Beautification Committee. Jim McGregor assisted in the design of the interior roof to achieve the best acoustics. The Rotary Club completed construction in the spring of 1986 and turned it over to the town. 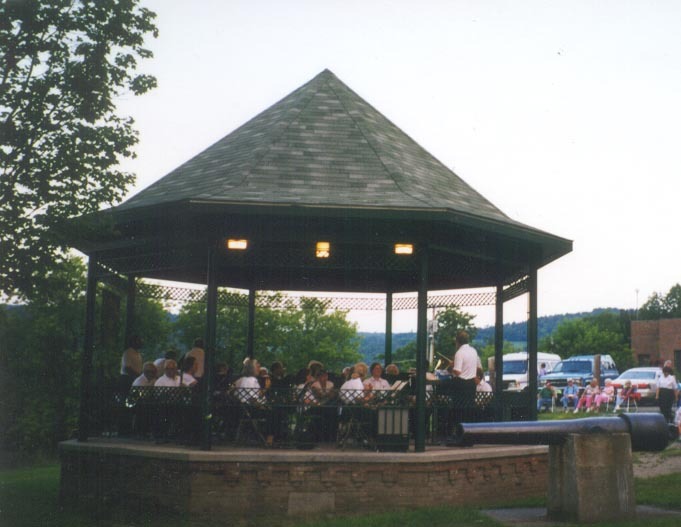 Archie Prevost and Sean Duffy dedicated the bandstand at the first Monday concert in June 1986. Soldier's Monument in Courthouse Square. St. Johnsbury. 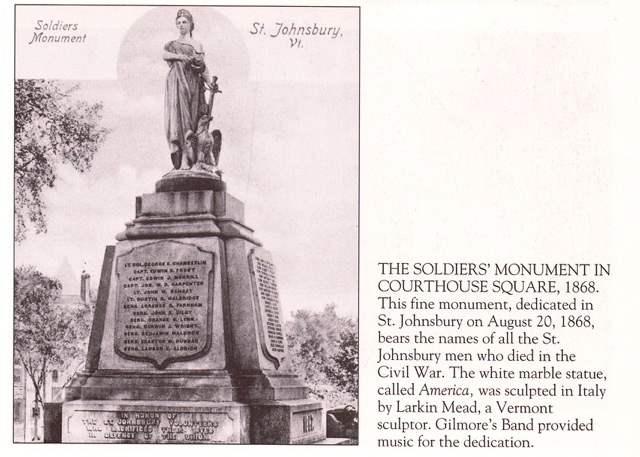 The monument is still stands next to the current bandstand where the St. Johnsbury Band performs Monday night concerts during the summer. 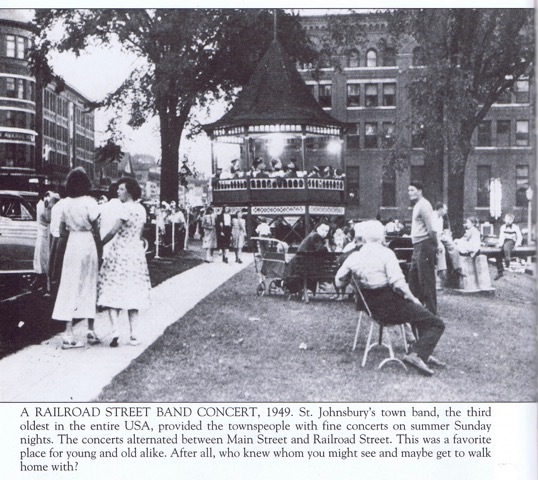 Railroad Street Bandstand (1949) where the St. Johnsbury Band performed concerts.